Did you mean: death high cost of living 1 1993 (75 items)? Death: The High Cost of Living #1 (Mar 1993, DC) EXTREME HIGH GRADE!! 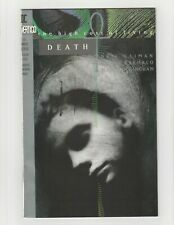 1 product rating - Death: The High Cost of Living #1 (Mar 1993, DC) EXTREME HIGH GRADE! !